Happy Easter everyone! 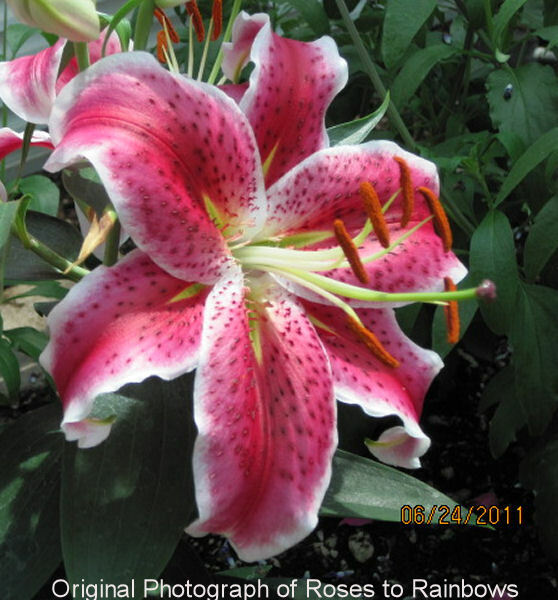 This year Easter falls on April 24, or one day earlier than the latest possible date. Because of the changing dates, Easter could nearly be considered a "floating holiday". I mean think about it, Christmas is always December 25 no matter what day of the week it happens to be, and Thanksgiving is always the fourth Thursday in November, no matter what the date. But Easter can be as early as March 22 and as late as April 25. Why is that? Aside from the date-related confusion, Easter brings many traditions, some religious, some cultural and some just for kids. Here are some of the things you see around Easter. Easter Eggs. The egg, the pagan symbol of rebirth, was adopted by Christians as the symbol of Jesus' resurrection. 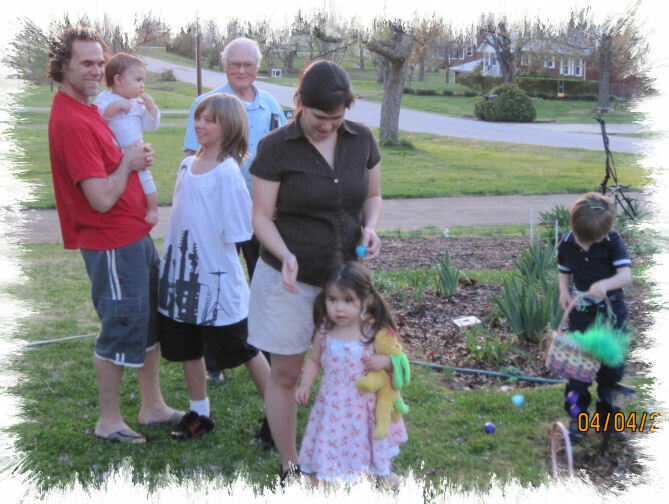 Today, a popular Easter activity is an Easter Egg hunt. Here's a tip for boiling all those eggs. As with most holidays, there is one or more foods associated with it. First is a tasty treat called Hot Cross Buns, which were allegedly small wheat cakes baked to honor Eostre, goddess of Spring. Later, Christians substituted sweetbreads blessed by the church. The roast lamb found on many Easter dinner tables dates back to the first Passover of the Jewish people. People would eat the roast lamb, hoping that God's angels would pass them over, thus the term Passover. Ham is another popular Easter entree. In the early days before refrigeration, any fresh pork that wasn't consumed during the winter before Lent was cured, and since this process takes a while, the hams were ready just in time for Easter making them the perfect choice for Easter dinner. What are some of your favorite Easter traditions? What do the bunnies and eggs have to do with the Christian holiday of Easter? 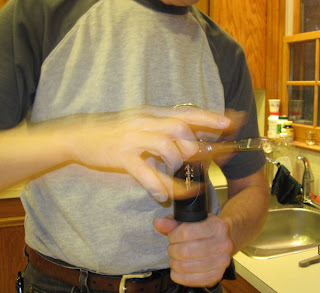 Many Christian traditions are rooted in pagan rituals. The egg, the pagan symbol of rebirth, was adopted by Christians as the symbol of Jesus' resurrection. 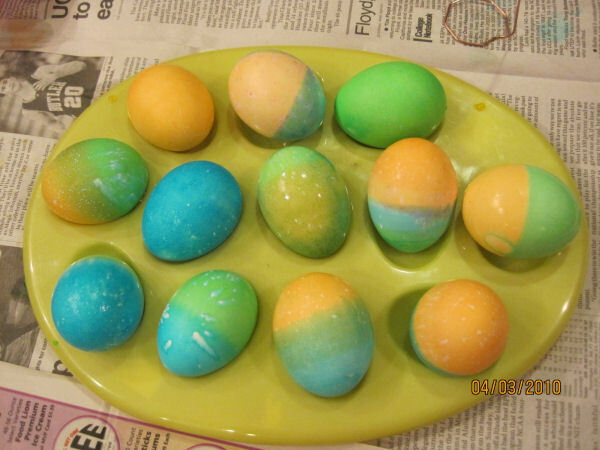 Decorating Easter eggs dates back to the 1200s at that time when eggs were a forbidden food during Lent. 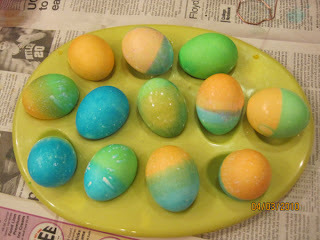 People would paint and decorate eggs to mark the end of the Lenten season and eat them on Easter Sunday in celebration. 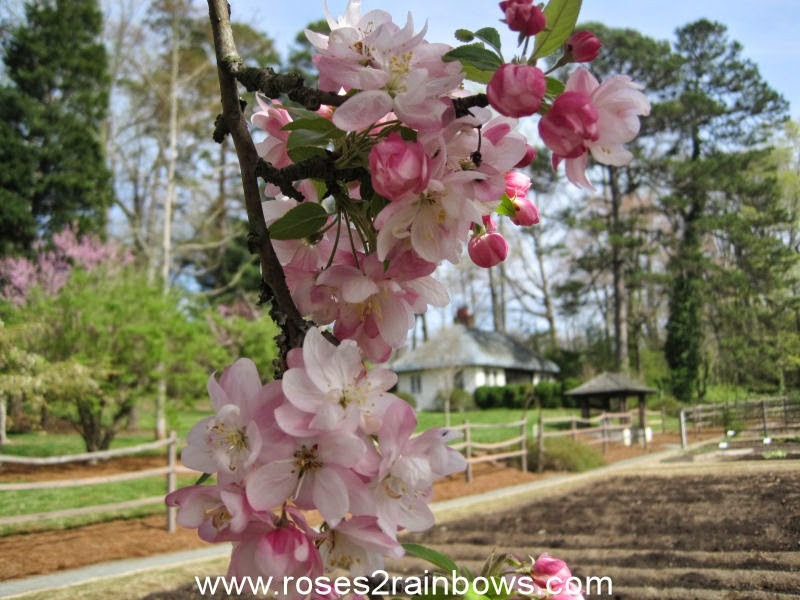 Some sources say that the word Easter is derived from Eostre, a goddess of Spring. Rabbits, known for their prolific procreation symbolize fertility and new life. The Easter Bunny arrived in the U.S. in the 1700's, courtesy of some German immigrants. This mythical, egg-laying rabbit was originally called Osterhause, Oster being the German word for Easter. 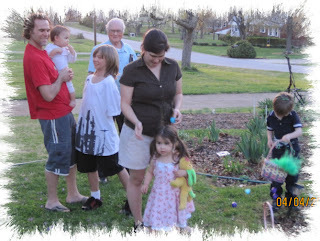 Click here for an interesting article and video on Easter facts and traditions. 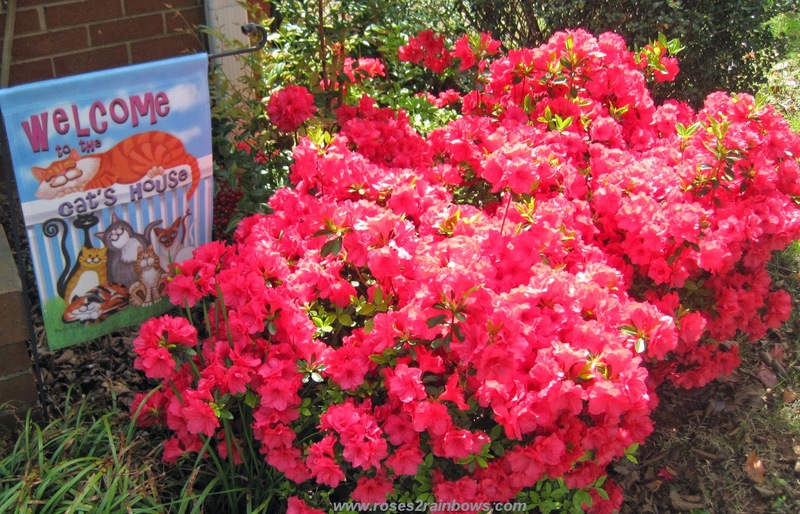 It was a happy Easter here in the Sunny South, and a gorgeous weekend in many areas so I've heard. 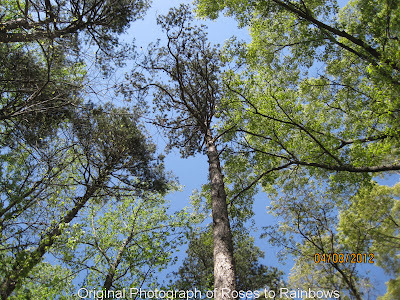 The flowers were blooming and the skies were clear and blue. Saturday night we had a pre-Easter/birthday combination dinner with DH's family. 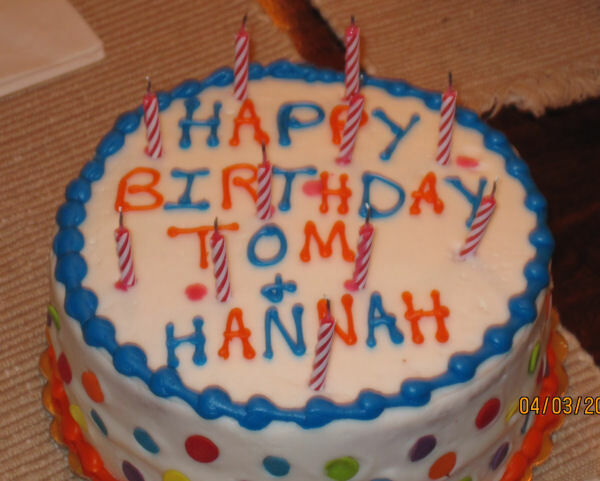 In addition to Easter, we were celebrating my niece's and bil's birthdays. We had grilled lamb, and a red velvet birthday cake for dessert. Afterward we dyed Easter eggs. That was the first in years for me. 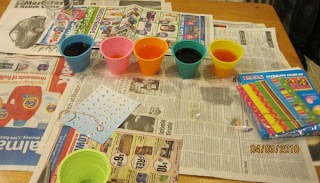 It was fun, and they turned out pretty good, considering we had blue, green and 3 oranges to work with. I don't know what happened to the red and yellow. I think the Easter Bunny would be proud of these! We started off Easter Sunday by attending the Easter service with Ashley and Kevin and the kids, followed by a pleasant lunch at El Paisano. Then Ashley and I and the kids went to PetSmart to get hermit crabs, while the guys went home to check out the leaking refrigerator. 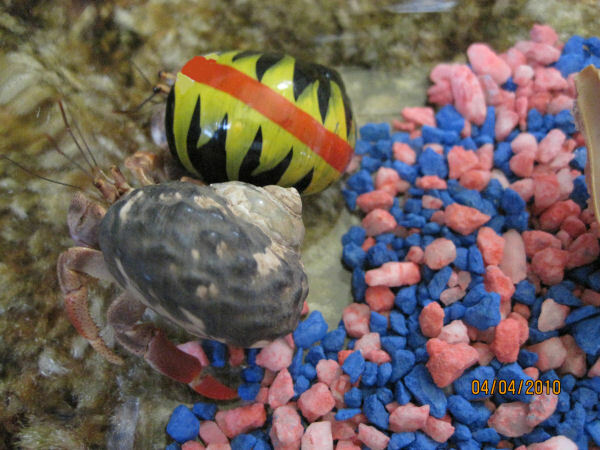 I got a short video of the crabs, named Hans (Scott's) and Cannonball (Michael's). 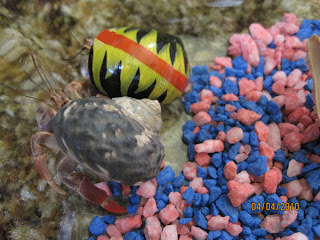 Hans is wearing the natural colored shell and Cannonball is yellow and black with a red stripe. I suppose you're wondering why the boys were telling the crabs to say "crab cakes". When I took pictures, instead of "say cheese" I was going to do "say crab flakes", like the crab food, but it sort of came out wrong - hmmm...what was I thinking? Hans actually got out of the shallow dish three times, so we had to get a deeper container to prevent further escape. We hung out with them for the rest of the day, and had a wonderful beef stew for dinner. Ashley's Dad and Kevin's brother's family all joined us in the kitchen for dinner. 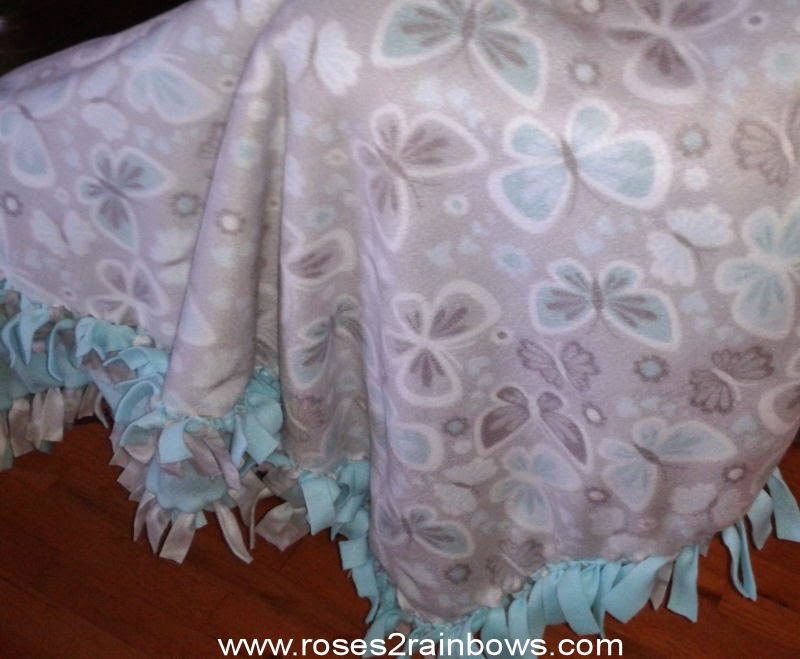 Spring has sprung and Easter is just around the corner again. With each passing year, so does the time pass faster and faster. There is no slowing it down, so hang on for the ride and live each moment to the utmost. Spring is a season of renewal, where not only do the flowers bloom and the trees leave out, but our souls are renewed as well. We cannot slow time down, but we can slow ourselves down...for a moment to drink deeply from well of spring. 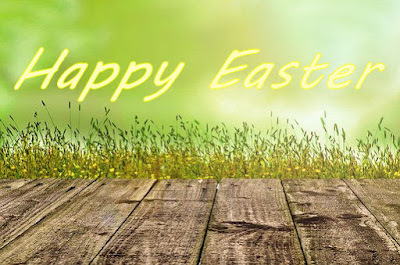 Have a joyful and blessed Easter. With Easter coming up this weekend, I thought it would be a good time to learn a little about this tasty holiday treat. They can be found in stores everywhere around Easter, they are sweet, spiced buns with currants or raisins and sometimes other candied fruits. They are leavened with yeast and have a cross made of icing on the top. 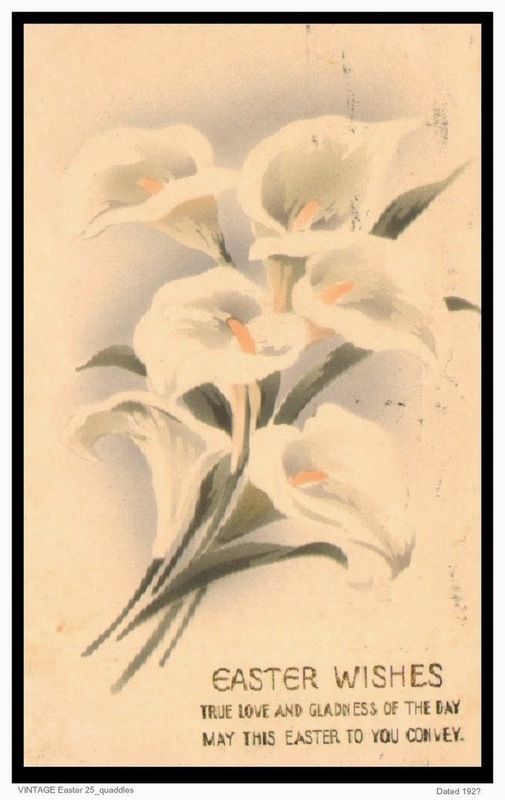 Traditionally, these are eaten on Good Friday with the cross symbolizing the crucifixion. The first use of the term Hot Cross Buns was recorded in 1733. 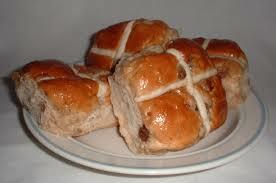 However it is believed that the Saxons ate buns marked with a cross to honor the goddess Eostre. This is probably the origin of the word Easter. This tradition is believed to have begun when Queen Elizabeth I banned them from being consumed except at festivals such as Easter and Christmas. In many cultures, breads play an important part in religious holidays. It symbolizes different religious events depending on ingredients and shape. There is a lot of folklore associated with Hot Cross Buns. Buns baked and served on Good Friday will not spoil or mold during the year. Sharing a bun with another ensures friendship during the coming year, especially if you say the following: "Half for you half for me, between us two shall goodwill be"
Some say that because of the cross, the bun should be kissed before being eaten. They protect against shipwreck on an ocean voyage. Hang one in the kitchen to protect against fire. There is even a nursery rhyme named for the buns. So try some Hot Cross Buns and share in a tradition that goes back centuries. 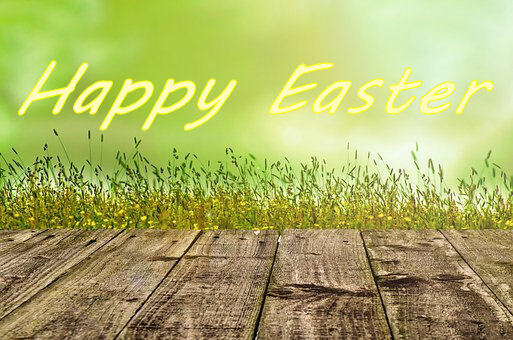 However you celebrate Easter, with family and friends or Spring break, Church or Easter baskets, or just enjoying life and the renewal brought by the changing seasons, I wish you peace and happiness. On this Easter Sunday… Forgive someone. This is Day 8 of the 2018 edition of the 20 Days of Chill writing challenge hosted by P. J. at A ‘lil HooHaa. Please join us this month on our writing journey. Today's prompt is Candy Bars. What do we think of first when we hear the word candy? Easter, Halloween, Christmas and Valentines, right? Guess what? Candy is a year-round thing from something to get you through the afternoon with that last cup of coffee or an after-school treat for the kids. There are so many kinds of candy bars–where do you start? There are dark chocolate and milk chocolate, plain and peanut, chewy centers and gooey centers, crunchy ones and ones filled with coconut. How can I pick just one favorite? I can't! But I can tell you what I like and don't like. I don't like ones the ones with chewy centers like Snickers or Milky Way. I feel like they are going to rip my teeth out. While I do like chocolate and peanuts together, I don't like Mr. Goodbars or peanut M&Ms. I like both dark and milk chocolate, depending on the candy bar. So, in no particular order, here are some of my favorites, and yeah they're not all technically candy bars. Other chocolate confections I like are brandied cherries (I don't like cherries otherwise), Whitman chocolates (soft centers only) and Lindt Chili dark chocolate bars. 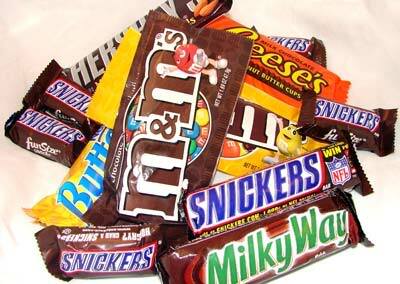 What's your favorite candy bar, or other candy? Constructed in the 1900s, and named for Katherine Smith Reynolds (Mrs. R.J. Reynolds), this 14-acre lake provided family and friends with fishing, boating and swimming. Silt from building and natural process began filling in the lake and by the 1990s, it was almost completely filled in. It is now a natural habitat for migratory birds and other wildlife. The dam upstream prevents this from returning to its natural state and it will continue as an artificial wetland. 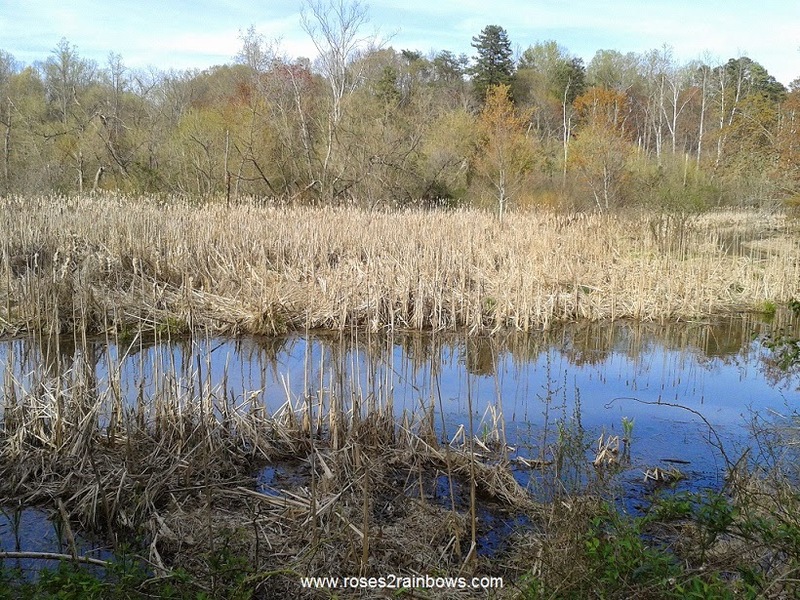 On Easter Sunday afternoon, after strolling around Reynolda Gardens soaking up some natural Vitamin D, we paused to take in the beauty of this wetland. We sat on an old, weathered bench and watched birds flitting from branch to branch, sometimes clinging to the bark of a tree leaning toward the water. As we were walking away, we heard a splash and turned to see two ducks had just landed. While I have been to Reynolda Gardens and the surrounding village several times in recent years, I did not know there had been a lake there. There is always something to be discovered, sometimes practically in one's own back yard. What discoveries have you made recently in your neck of the woods? Spring is a beautiful time of year made even more special by spending time with good friends. I hope everyone had a wonderful Easter weekend - I know I did. - Isaac Watts, "Divine Songs"
I hope everyone had a happy and joyous Easter! And You Thought It Was His Car? 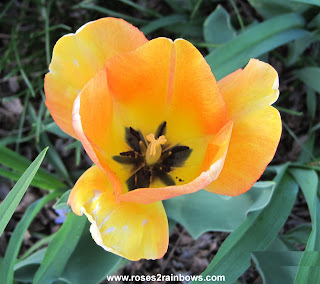 In the month or so since Easter, I've had several opportunities to drive hubby's new car, so I thought I'd post some of my impressions and observations. First off, I didn't beg or finagle it away from him, he just prefers the extra 5 mpg from his 15-year old Saturn, and it does make a difference on his 40 mile (each way) commute to work. I kid him that he let's me drive it so I'll wash it for him. Now for the technical stuff. Although the Accord is less than 6 inches shorter and only 250 pounds lighter, it drives like a much smaller, lighter car than the Cutlass Supreme I'd been driving for the last 12 years. It has great visibility, and maneuverability, and is rather peppy. I say that last part because it's the first four-cylinder car I've driven except for test drives. No thermometer for inside or outside temperature. The doors do not lock automatically when you put it in gear. The doors do not open without physically unlocking them. Overall, I do like it, and in spite of the few differences, the driving experience is still quite similar to my recently deceased Oldsmobile. The downside is that there isn't anything distinctive about its appearance - I mean, there's got to be a zillion gold Accords out there.